Okay...so we lost a job. Insult to injury...the Cobra bill just showed up. Right when pay takes a hit, you get a monster bill for Cobra coverage to continue the old group plan. So what can we do in this situation? Short term is a popular way to bridge the gap between jobs. We need to really understand the difference between it and ACA plans like Covered Ca. Will short term health work between jobs? Short term health is very different than the ACA plans. They are generally designed for a 1-3 month window of coverage. This might fit the bill perfection if you're losing employer coverage. The cost can be much lower than Cobra coverage and maybe even Covered Ca depending on whether you're eligible for tax credits. We need to look at that last piece and understand what gain and what we lose with short term. Let's understand the important points of short term during gaps in coverage. The real reason most people choose Short term between jobs is cost. 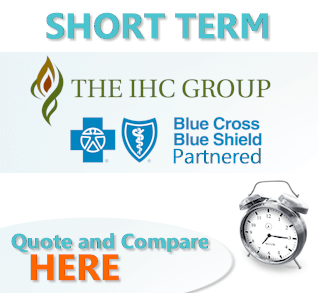 Run your short term quote here to see how it compares with Cobra option and ACA plans. So let's look at situations where short term works well for people losing their job. Most health plans through employers have a waiting period before you can get on board. Let's say you start a new job on June 1st but the health plan won't start till Aug 1st. We have two months to cover. That's where short term comes in handy. Keep in mind that the ACA law has a 3 month waiver from the tax penalty each year. 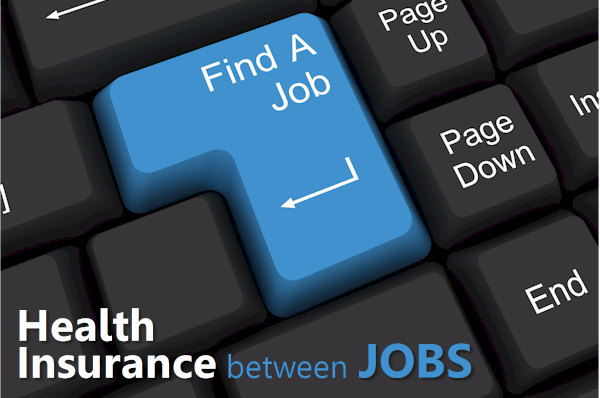 You can get short term coverage to handle this 2 month gap till the new job insurance starts. Some people have a pretty good estimation of their ability to get a new job and benefits. In this case, short term is an easy fix to cover till the new plan starts. 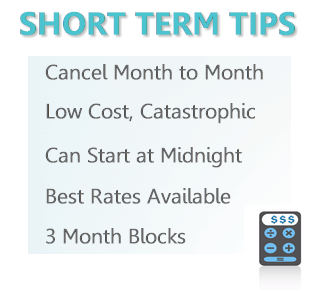 Generally, if you don't expect more than a 3 month gap, short term might fit the bill for you. If you exhaust the 3 month block, you can re-apply as long as we're in good health. You can also cancel month to month if you get coverage and a job before the 3 month window. We can cancel in 30 day blocks. Look...you may not be able to afford Cobra. We've seen Cobra bills that are $1000's of dollars per month. This is hitting people at the worst time since they just lost their job. It may not even be a question. That's no decision to make. As long as you don't qualify for a tax credit (more info below), short term may be the only way to make sure you have catastrophic coverage so you're not wiped out. Since short term plans don't have all the requirements of ACA plans, they can be 30-40% cheaper! It's important to understand the differences at Short term versus Covered California. Some people don't want maternity and all the bells/whistles that Covered California mandates. They just want to cover the big "What If". Short term does a good job of this. It's really designed to cover injury/illness big bills. Again, we're covering a short period of time after losing employer coverage. It's not a question of preventative benefits or doctor visits. We typically hear, "In case I get hit by a bus"
Poor buses get a bad rap...seriously...that's the standard line. It does highlight what Short term is good for. Bus hits and other big things that can happen. We see this more than we should. Usually, coverage is supposed to go through month's end. This is important since most new plans will start on the 1st of a given month. This leave people with a gap between coverages. Short term may be the only way to address this. Let's say you have coverage through June 10th. You may have a new job with coverage starting July 1st. What to do about the 20 day gap there? Short term can handle this. Basically, you can get 30 days (the minimum) of short term to bridge between the job plans. It's frustrating to pay for a full month of coverage for a partial gap but that's the best we can do. That's why we don't like to see coverage ending mid-month. It's unfair to the insured! 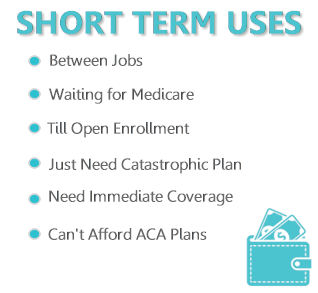 Those are the most common reasons people use short term to fill gap between job health insurance. Let's touch base on the Cobra and Covered Ca question. If you're losing coverage, you may be eligible for Cobra. For some people, Cobra is just too expensive. That's why they pick short term. Cobra is different coverage so it's important to understand how it differs. We wrote an entire article on Cobra versus Short term. One note...you can use Cobra as a backstop since you'll have a 60 day window from last date of prior job coverage to elect it retro-actively back to last date of group coverage. You can get short term during window and have Cobra as back up. This only works for 60 day blocks of time. Again, check out the article above if you have a Cobra option. Okay...this is a little more involved. Basically, losing group coverage is a qualified event that allows you to enroll in Covered Ca immediately after losing the group coverage. You must enroll prior to the 1st of the month it will start in. It comes down to tax credits! Based on income, you may be eligible for tax credits. The short term versus Cobra or Covered Ca can be involved. Make sure to read the articles if you're offered either of these. If you're losing coverage, you may be eligible for BOTH! Temporary coverage is very popular for people who have lost employer coverage. This is primarily a function of cost. It also turns around quickly and does a good job with catastrophic protection. It's not right for everyone and we're happy to walk through your situation to see if it's the right fit. Check out our article with everything you ever wanted to know about short term health coverage. You can quote gap coverage between jobs here anytime. You can run your Short term health insurance between jobs quote here to view rates and plans side by side from the major carriers...Free.